Priyanka Chopra has found a permanent spot on the list of trends since her wedding festivities began last week. One of the reasons that Priyanka climbed up the list on Thursday is because she added Nick Jonas' surname to hers on Instagram. Priyanka Chopra's Instagram name is "Priyanka Chopra Jonas" now. Aww, that's so sweet. 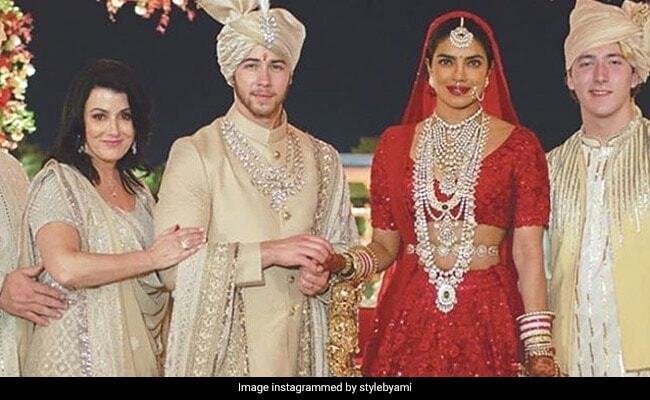 Priyanka Chopra and Nick Jonas' big fat wedding festivities were for three days with Jodhpur's Umaid Bhawan Palace as the venue. The couple had a Christian wedding ceremony on December 1, which was followed by a Hindu wedding on December 2. Following their wedding festivities in Jodhpur, the couple hosted a reception in New Delhi, which was also attended by Prime Minister Narendra Modi. Priyanka and Nick, both of who have been strictly guarded about their wedding photos, released glimpses of both their wedding ceremonies earlier this week. While Nick captioned the photos as: "Happiest day of my life," Priyanka had written: "And forever starts now." On Thursday, Priyanka Chopra received an adorable note from Nick Jonas' brother Joe, who welcomed her to the Jonas family like this: "Super married! I love you both! Welcome to the family, Pri. Congratulations! My face hurts from all the smiling this week." Priyanka has been placed #94 on Forbes' List of 100 Most Powerful Women of 2018. She also recently trended for the Internet's strong defence of her against an offensive article by The Cut, which has now been taken down and replaced with an apology. On the work front in Bollywood, Priyanka Chopra is currently working on The Sky Is Pink, her film with Farhan Akhtar, which is being directed by Shonali Bose.